Today's So Shoe Me id the Clear Strap Pumps by Tibi, $435, available at Shopbop. Modern, chic and athletic these luxe pointed toe pumps by Tibi add a fresh detail to any style. 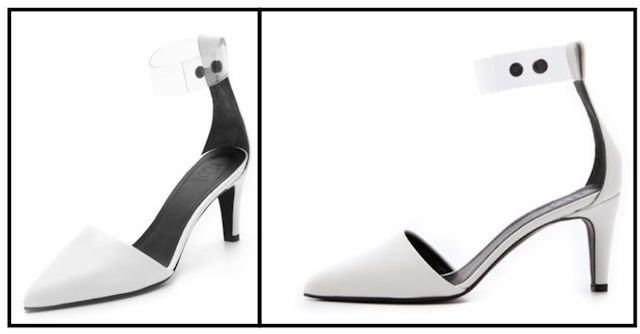 Sleek elements like bright white leather and a mid height heel add a designer edge, perfect for pumping up basics and last season's must haves. The clear PVC ankle straps create a cool see-through design which are barely there, but steal the show at the same time. The clean and crisp design has on trend athletic inspiration and elongates the legs with a perfectly pointed toe and invisible ankle strap (that won't cut off your legline). The perfect investment piece for transitioning from winter into spring these modern heels will look great with sandals, socks, denim and anything in between. Pair these heels with a bold perforated leather bra, fresh white jacket and high waisted pants for an outfit with edgy athletic appeal. So Shoe Me a pair of minimal and modern pointed toe pumps that will add a crisp finishing touch to my favorite signature separates.